Don't just buy any Fan, Invest in a Typhoon Fan you can rely on to pass down to the next generation. When you make a decision to buy a Typhoon Fan you can be assured it will be built to last, following decades of experience from many thousands of drying hours. As all our fans are built from scratch at our factory, we are able to customize the size and frame to suit any fan house configuration. The TYPHOON "TLV" range of low volume fans are most commonly used for ventilation, to control the temperature in ‘dry’ stores where the grain has already been dried down to the desired moisture content level. They are, therefore, not designed to reduce grain moisture content, but are used to blow cooling air through stored grain in order to prevent deterioration through overheating. Nevertheless, grain stored at moisture levels of up to 20% can be stored safely for a significant period of time, if the ventilation system can provide an adequate flow of air which will enable the temperature within the grain to be reduced to a level which will prevent sprouting, mould growth and insect activity. 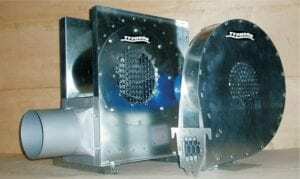 The TYPHOON “TC” range of centrifugal fans incorporates many years of experience in the design and manufacture of fans for drying and conditioning of grain, potatoes and onions, and in more recent years wood chip. They are of rugged all steel construction and have high efficiency backward curved impellers which have non-overloading characteristics whilst maintaining excellent performance against high back pressures. Powered by 3 phase 415v 50Hz electric motors, engine or tractor PTO. Available in standard external fan house configuration or downward discharge, on tunnel configuration. These fans will give many years of trouble free service. Fans can be supplied with control panels, Stardelta starter, motor fuses, overload, door isolator and full humidity and temperature controls. 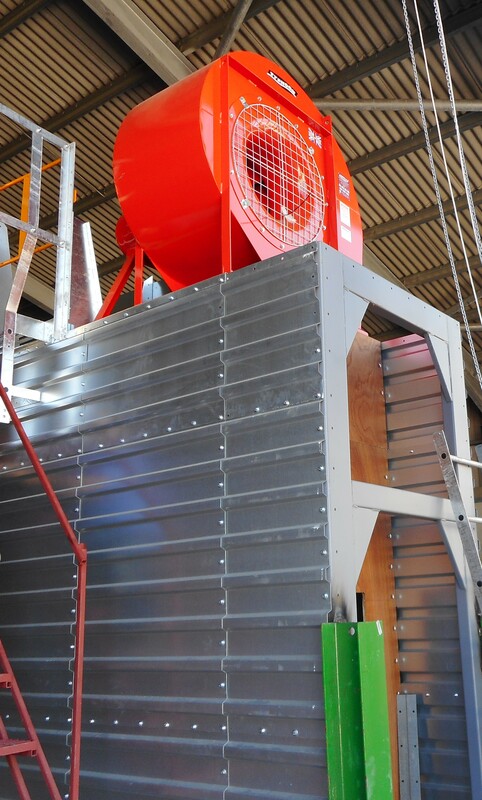 The TYPHOON "TAB" range of mobile centrifugal fans are primarily used for drying smaller parcels of grain, oil seed and pulses; often stored in bins, the drying of baled hay and the ventilation of potatoes, onions and flower bulbs. Wheels and a handle make these units fully mobile. Available with either single or three phase electric motors.